Puerto Rico, a picturesque Caribbean island that is a U.S. Commonwealth and home to three and a half million people, is currently in dire need in the aftermath of Hurricane Maria. As aid flows into the island, many people are learning about Puerto Rico’s rich history and society for the first time. Part of the Commonwealth’s unique history is its extensive Jewish ties, going back centuries. Here are seven facts about Jews and Puerto Rico, and information about how you can help the island now. The first Europeans to discover Puerto Rico was Christopher Columbus’ crew, on a voyage to the island in 1493. Some historians speculate that Columbus himself, who left Spain on the date that all Jews were banished from the kingdom, was himself a secret Jew. At least one secret Jew, Louis de Torres, sailed with Columbus, and Columbus’ voyage was financed by Spanish Jews. 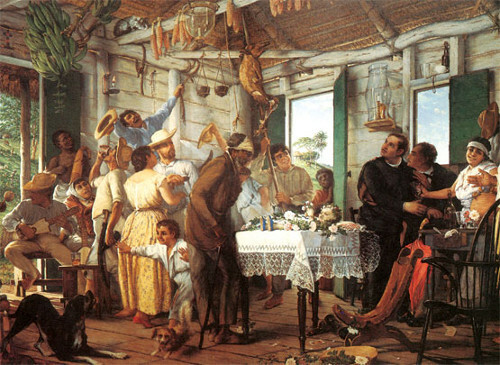 Puerto Rico was formally incorporated as a colony of Spain in 1508, which made it off limits to any potential Jewish settlers under pain of death. The Inquisition ruled that not even conversos, Jews who had converted (or pretended to convert) to Catholicism, could live in Spain’s territories overseas. However, it’s thought that secret Jews did settle in the island, living in remote mountain regions where few people would notice their curious way of life. One Jew who defied the Catholic Church to live in Puerto Rico, a trader named Judah Cohen from the Caribbean island of Curacao, was caught by Spanish officials and put to death in 1723. Other secret Jews adopted Christian-sounding names. The name “Mercado”, meaning merchant, in particular was thought to be popular among Puerto Rico’s secret Jews. Historians have uncovered evidence of a few Jews living in Puerto Rico during Spanish rule: a woman named Sarah Nunes Mercado who lived in Guayanilla in 1805, a Jewish man named Elias De Sola in that same area in 1839. The city of Aguadilla seems to have been the home of a small Jewish community: a Jew named Solomon Senor died there in 1849 and a Jewish physician by the name of Isaac de Lima openly practiced in the town of Mayaguez in the 1840s. When the United States won Puerto Rico from Spain in the Spanish-American War of 1898, Jews for the first time were allowed to live openly on the island. The first openly Jewish residents were American servicemen fighting in the territory; roughly 5,000 American Jewish soldiers fought in the Spanish-American War. A small handful of these soldiers remained in Puerto Rico and formed the core of a nascent Jewish community in the southern town of Ponce. Col. Noah Shepard served as an unofficial leader of this group, and Rabbi Adolph Spiegel, who had served in the US forces, remained in Ponce for several years. Many of these Jewish former servicemen worked in Puerto Rico’s administration, helping to create its legal code and court system, and worked in public health to help eradicate tropical diseases from the island. With World War II, Puerto Rico saw another influx of American servicemen. 400 Jewish soldiers were posted to the island during the war, and held services and a community Seder for the islanders. After the war, federal incentives drew investors to Puerto Rico, and hundreds of businesses opened on the island, bringing in a substantial number of American Jews. A series of coups and repressive regimes in Latin America brought Spanish speaking refugees, including many Jews, to Puerto Rico. The earliest wave came in the 1960s, after Fidel Castro seized power in Cuba. Many of these early refugees were Holocaust survivors who’d been living in Cuba, and now found a safe haven in the US Territory. “Puerto Rico was a welcoming society and it had many similar characteristics to Cuba – the language, the island life – so it was an easier transition for many (Cuban Jews) compared with going to the United States,” explains Diego Mandelbaum, the director of Puerto Rico’s Jewish Community Center. Mr. Mandelbaum was born in Argentina and his journey mirrored that of many other Spanish-speaking Jews and non-Jews. After the military junta in Argentina, many refugees, including Jews, arrived in Puerto Rico seeking a new life. In more recent years, repression in Venezuela has brought still more émigrés to the island. In the 1980s, Israel pioneered a cutting-edge agricultural development program in Puerto Rico, bringing advanced Israeli irrigation and agricultural techniques to the island. About 200 Israelis came to the island and built a state of the art educational farm on 2,000 acres in the Santa Isabel region in the south of the island. In time, they named their innovative farm “Gan Eden”, Hebrew for the Garden of Eden. “Gan Eden” developed Puerto Rico’s first commercial mango orchard and a vegetable farm. 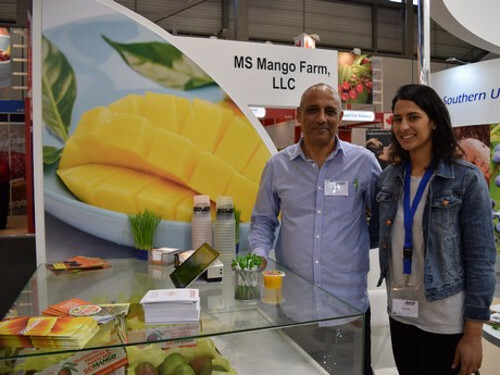 Currently run by the Israeli agronomist Yoav Cohen, the farm sells mangoes in Europe and a range of produce including papayas, squash, cucumbers and peppers in the US. Puerto Rico’s Senate passed a resolution in 2005, formally recognizing friendship between Puerto Rico and Israel, and the contributions of Puerto Rico’s Jewish community to the island’s way of life. 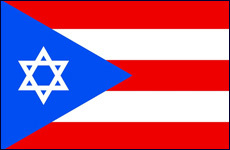 Today, Puerto Rico is home to approximately 1,500 Jews, the largest Jewish community in the Caribbean. Most Jews live in the capital San Juan which boasts three synagogues, a Jewish Community Center and a kosher grocery store. The island also is home to a Hebrew school, a Zionist youth club, and other Jewish organizations. The island’s Chabad center offers a kosher restaurant and catering, serving over 30,000 meals annually. The number of Puerto Rican Jews has been in flux. After a high in the 1990s, the community has been declining. “About 90 percent of the children are sent to college in the United States, and most never come back,” explains Mr. Mandelbaum. In recent years, a new round of investment incentives have brought new businesspeople to the island, including some Jews. On Rosh Hashanah 2017, Hurricane Maria made landfall with Puerto Rico as the third strongest hurricane ever recorded on land in the United States. The devastation was immense. 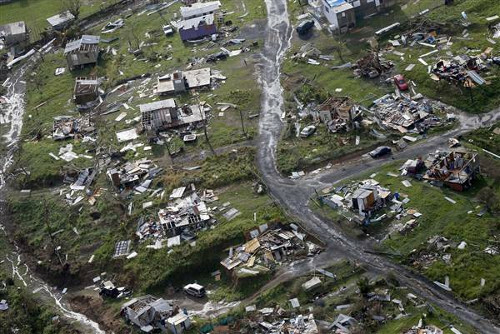 A week after the hurricane, 97% of the territory remained without power and struggled to get basic supplies. Half did not have running water. Puerto Rico’s Governor Ricardo A. Rossello has warned of a “humanitarian crisis”. As people struggle to deliver resources to the island, Puerto Rico’s Jewish community, itself battered by the storm, has been coordinating aid. The Chabad Jewish Center of Puerto Rico, located in downtown San Juan, was flooded with hundreds of gallons of water. Rabbi Mendel Zarchi described the scene that met him outside his Chabad center: “Blasted-out windows, toppled utility poles mangled with an overwhelming amount of downed trees (and) smashed cars.” Attempts to reach the Chabad center by phone proved impossible a week after the storm. Israeli aid organization IsraAID has sent emergency responders to aid in Puerto Rico. With a host of natural disasters in the Americas, IsraAID currently has teams in Mexico, where it has used Israeli expertise to coordinate rescues after the earthquake on September 19, 2017, and in Houston, Miami and the Florida Keys, where it is helping recovery efforts after Hurricane Irma. Next Post ¿Cuánto valen unos Tefilín?